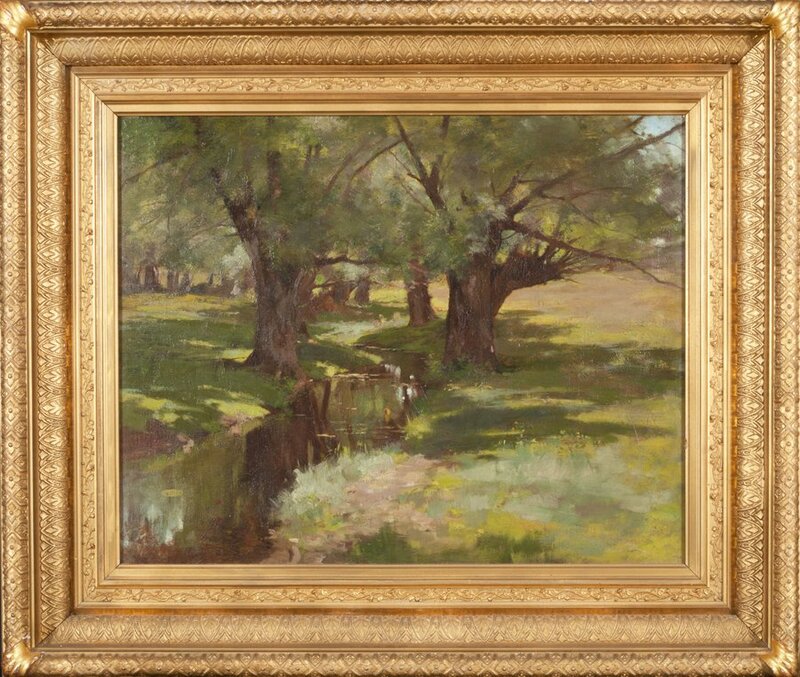 Historic New England recently acquired The Shaded Stream, a painting by Laura Coombs Hills (1859-1952), an important member of the Boston School. While Hills is best known for floral watercolors and pastels and miniature paintings on ivory, in the 1880s she painted a group of Barbizon-inspired landscapes in oil. The Shaded Stream is one of these paintings. These oil paintings bear a stylistic relationship with the work of her art instructor, Helen M. Knowlton, who had taken over the women’s art classes of William Morris Hunt. It is also likely that Hills was inspired by the work of young Bostonians, who in the late 1880s were experimenting with Impressionist techniques they learned in France. “This is one of just a few examples in our painting collection by a member of the Boston School and the first painting in our collection by a successful woman artist of that period,” said Historic New England Senior Curator Nancy Carlisle. The painting will be installed at the Eustis Estate Museum and Study Center (1878) in Milton, Massachusetts. See it when the property opens in May 2017.